Capitol Hill | Washington, D.C.
Join us on Thursday, June 14, 2018 at our Capitol Crypto event in Washington, D.C. 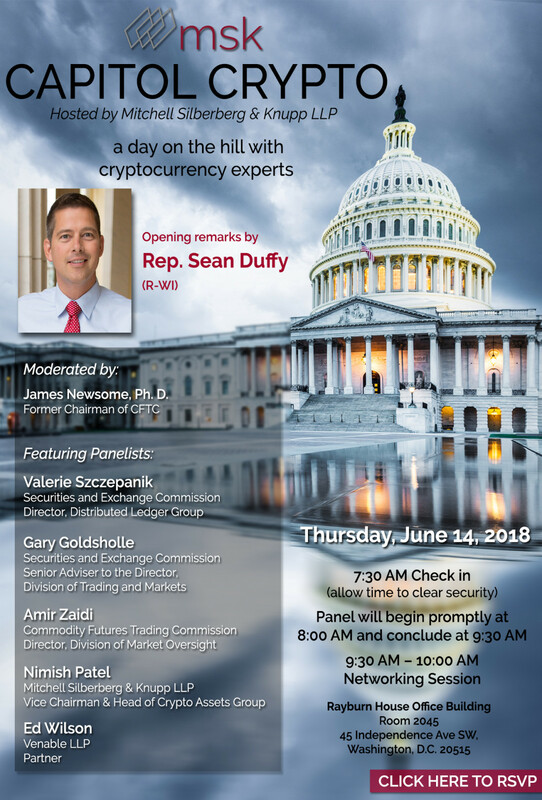 This will be a one-of-a-kind event featuring cryptocurrrency experts from the SEC and CFTC, as well as Rep. Sean Duffy (R-WI) and Nimish Patel, MSK Vice Chairman & head of our Crypto Assets & Blockchain Technology Practice. This event will offer updates and insights into the regulatory landscape surrounding cryptocurrency. Nimish Patel - MSK | Vice Chairman & Head of Crypto Assets & Blockchain Technology Practice.